You are currently browsing the Carpe DMM blog archives for August, 2011. This morning was an early start, after another cruise during the night to the island of San Cristóbal. We assembled at 06:00 on the top sun deck of the boat for a view of the approaching Léon Dormido (also known as Kicker Rock) – a volcanic lava cone now exposed as a bare chunk of rock jutting from the sea several hundred metres off the shore of the main island. The aim here was to do a couple of circuits of the rock to observe the nesting and courtship display of frigatebirds. The rock is split by a narrow channel of water, otherwise presenting a steeply sloping profile that gives it its Spanish name of “sleeping lion”. There are only a few alcoves where a sea lion can haul out of the water, and these were populated by dozing beasts. We also saw lots of blue-footed boobies nesting or streaking the rock with guano. 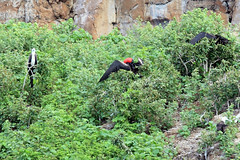 But the major attractions here were the magnificent frigatebirds, which nest on the rock. As the boat did a circuit, we could see several nests with birds on them, and as we watched the males inflated their large red throat sacs in their spectacular courtship display. They were necessarily one or two hundred metres away, but we got good views through binoculars or telephoto camera lenses. The boat circled the rock twice, allowing us plenty of time to see the various birds. We also spotted a Pacific green sea turtle in the water at the base of the rock, watching it surface to breathe a few times before it disappeared again. Having completed our circuits of the rock, the boat set out for the small town of Puerto Baquerizo Moreno, the capital of the Galapagos province of Ecuador, on the southwest coast of San Cristóbal. We had a brilliant lunchtime seminar by a guest speaker at work today. She talked about origami. She presented origami as a composition of two functions: a first one-to-one (and thus bijective) mapping from a flat sheet of paper to a 3-dimensional folded version of that sheet of paper – specifically a folded version which produces a number of points that can be used as the basis of extremities of a model (for example, animal limbs, fingers, horns, etc); and a second function mapping that 3-dimensional structure to a tree diagram with nodes at end points and junctions. The second mapping doesn’t preserve point correspondences or distances, but (and she proved this as a theorem) points on the tree diagram corresponding to points on the sheet of paper are separated by a distance less than or equal to their separation on the paper. The upshot of this is that you can sketch a three-dimensional stick figure of anything you like, with correctly proportioned stick lengths; then map that on to a flat sheet of paper such that you produce a tree with nodes and branches in analogous positions such that the distances between them are equal to or greater than the corresponding distances in the stick figure; then from there you can apply a deterministic algorithm to figure out the arrangement of mountain and valley folds to produce the points at the nodes. There are programs that can do this and solve the fold pattern for any desired stick figure in a few minutes. The result is a map of exactly how to fold the sheet of paper to produce a 3-D model that resembles your stick figure, with the correct number, arrangement, and lengths of all the extremities. From there it’s a simple matter of subtly modifying the shapes of the points with additional folds to produce an accurate model of your desired shape. She showed an example of a buck deer with four legs, a tail, a head with a nose, and two antlers, each with 4 distinct points. The resulting tree has 14 leaf nodes, and produces a complex fold map, but it’s perfectly doable, and the resulting origami model looked amazing. I was utterly blown away. I always figured origami artists created new models by trial and error and months of hard work. But apparently you can do it with a stick figure sketch and a simple piece of mathematical computer code, in a few minutes. I should stress this only produces the basic “stick figure” form, and the subtle shaping of a 14-pointed piece of folded paper into a realistic deer shape still takes artistic talent, but still, I was amazed that the hard structural part of the work was so tractable and solvable by a beautiful application of mathematics. It shows how mathematics can be applied to surprising fields and come up with usable models and solvable answers for problems that seem unapproachable any other way. Very nice stuff. Falling in love with Eurythmics all over again. I can’t believe it’s been 26 years since they released Be Yourself Tonight. I just discovered that at least year’s Emmy Awards – almost exactly a year ago – the Star Wars Uncut project won the Emmy for Best Interactive Media. The Star Wars Uncut project that some friends and I filmed two of the segments for. We won an Emmy Award. Yeah, okay, we contributed a tiny part of the whole, and it was all organised and run by other, more deserving people… but…. We won a frakking Emmy Award. I am so putting that on my resumé. Why do computer scientists insist we start counting at 0, and then put “0” after “9” on the keyboard?? The 2011 CiSRA Puzzle Competition is in its last few days. It’s hard making new and interesting puzzles, but what’s even harder is figuring out how difficult they are for other people to solve. We test all of our new puzzles on each other, to make sure that it’s possible for someone to actually solve them. Then we provide feedback and suggestions to tweak the puzzle, make it more elegant, make difficult steps more compelling, provide extra hints within the structure of the puzzle where we think they’re needed. And once we’re done, before we publish the puzzles, we assign a difficulty rating in three relative levels: Easy, Medium, or Hard. This is a very subjective thing. It’s really, really tough. Of course some people will solve some puzzles faster than others, while other people will find them to be of opposite difficulty. We try to factor in the amount of work, the amount of knowledge, the level of logic needed to progress, and – hardest of all – the difficulty and non-obviousness of any intuitive leaps that you need to make. We come up with a rating, stick it on the puzzle, and then it goes out in the competition. In Group 4, we published 4 puzzles, three of which we rated Medium, and one Hard. After 24 hours, the Hard puzzle had more teams solve it than all the others put together, and one of the Mediums – in fact the one that several of us puzzle creators thought was the easiest of the group – had no teams manage to solve it. In five years of running this competition (that’s 100 puzzles), we’ve previously only ever had one puzzle go unsolved after 24 hours before, and that was a puzzle we all knew was the hardest thing we’d ever published until then. But this one, this year… we’re flabbergasted that it proved so hard for the competition teams. Assessing puzzle difficulty… is Very Hard. Woo! Getty Images selected another 7 of my Flickr photos to be added to their collection for licensing to commercial buyers. And I realised this is where the money mysteriously appearing in my PayPal account is coming from. I went through my Getty statements for the past few months and realised I’ve made several sales. One for a book published by the UK National Trust! 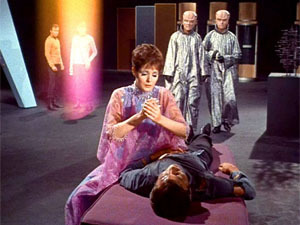 “The Empath” is a weird episode that looks very much like they ran out of budget to build sets. Most of the episode takes place in an interior that is obviously a sound stage with a few props and no walls – the scene just fades away into unlit blackness in the distance. It begins with Kirk, Spock, and McCoy (being the three most expendable members of the crew) beaming down to a planet to evacuate a research station because the planet’s sun is about to go nova. But the researchers have vanished, possibly something to do with the unnatural 4 shadows cast by the unusual lighting on the planet’s surface. After a quick look around, they vanish as well, mysteriously reappearing 121.32 metres below the surface of the planet, according to Spock’s tricorder. Here they meet the mute Gaussian girl of the week, who inhabits this mysterious empty subterranean sound stage, with only a prop lounge to sit on. It turns out she (dubbed “Gem” by McCoy, who takes a fancy to her) is an experimental subject being used by a pair of sinister big-brained rubber-forehead aliens, the Vians. They torture Kirk and McCoy to see how Gem reacts. She turns out to be an empath, having the psychic power to heal by transferring wounds to herself. Basically, the Vians want to see if Gem is self-sacrificing enough to deserve to live, whereupon they’ll save her entire planet and species from the nova. Not that the existence of another populated planet in the star system was mentioned before. Kirk sums up with an empassioned speech about the importance of emotions over implacable indifference that convinces the Vians to stop torturing everyone and just get on with saving Gem’s people. They agree and vanish with Gem, and return the crew to the Enterprise in an ending that seems way too rapid, given the amount of padding earlier in the episode. The question of what the Vians actually do with Gem and her people is never actually answered – for all we know they buggered off and murdered her off-screen. Oh well, never mind, Kirk, McCoy, and Scotty end the episode with a biblical reference and head on to their next adventure. Well, it’s kind of a blah episode. Honestly, I was just bored by it. By the end I didn’t really care what happened any more, if only they could get out of that unlit sound stage. Gem really only came across as sympathetic because she was the Girl of the Week and therefore you knew she was supposed to be. And the main plot element was never really resolved unambiguously at the end of it all. Tropes: Ontological Mystery, Ludicrous Precision, Cute Mute, Gaussian Girl, Girl Of The Week, My Brain Is Big, Rubber Forehead Aliens, The Empath, Psychic Powers, Empathic Healer, Secret Test Of Character, Humanity On Trial (variant species), Description Cut, Shirtless Scene, Sadistic Choice, I’m A Doctor, Not A Placeholder (twice! ), Talking The Monster To Death, Emotions Vs Stoicism, Screw You, Elves!, Padding, As The Good Book Says. Body count: Two scientists from the research station, found dead in giant test tubes in the wall-less sound stage.